Home Alarm That Works With Nest: What are your options? The Nest is an advanced learning thermostat system, through which you can program your temperature to suit your home and your family. Over time, the Nest thermostat is able to determine the most efficient methods of cooling and heating, and can be programmed to do so at specific times. Like many smart home features, it can also be controlled remotely. But the thermostat system is more than just a thermostat system. It can be integrated with other solutions to perform other functions and that is where a security alarm system comes in. Nest provides security alarm systems that can provide rudimentary sensors and Nest security alarms. 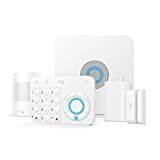 Nest does provide alarm system modules, such as sensors, that can be attached to the existing Nest system. But like many DIY types of security solution, these aren’t monitored services; these are services that you would need to monitor on your own if you want to keep your property safe. Consequently they may not be the best choice for those who are truly concerned about their safety. But for those who have connected Nest video surveillance equipment and alarm systems, it may be desirable to integrate these into an existing security system. What Security Solutions Work With Nest? Nest has a list of appliances, such as Google Home, that works with it. But other systems can also be integrated into the Nest solution if the security company is willing to do so. This is because the Nest solution uses an app that can be connected to in a variety of ways. If the security company supports a Nest alarm, they are able to integrate the thermostat solution into an overall security solution. Any security solution can operate in tandem with Nest because Nest itself does not interfere with security solutions or directly interact with them. Still, because Nest is fairly expensive compared to other security equipment and it isn’t a monitored solution, it’s better to get all of one’s equipment from the security monitoring service of your choice. Before you get a Nest alarm, you may want to look into comparable technology. Contact Protect America today to learn more.